Whether your application requires solids removal, clarifying, purifying, or polishing – continuous, high-speed centrifugal separation is a demanding process. 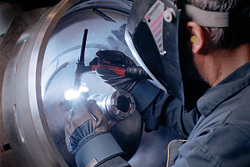 And centrifuge maintenance isn’t always planned, which is why you’ll find an Alfa Laval service center located throughout the US to ensure rapid service, with the level of expertise you expect with Alfa Laval – all while minimizing downtime. 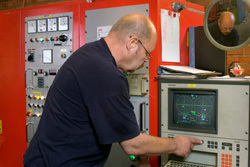 Knowing that your budgets and service capabilities can also change, we offer flexible options. Starting with simple annual check-ups, our factory trained technicians inspect, clean and replace gaskets, seals or other Genuine parts. More comprehensive service options include disk stack centrifuge reconditioning or bowl balancing – even bearing or gear replacement. Includes a thorough bowl, inlet/outlet and disc stack inspection and cleaning. 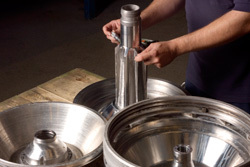 Critical to all applications, mechanically polish or coat disk stack or bowl surfaces. 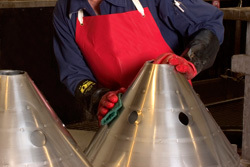 Restore your centrifuge frame, skid, piping, or inlet/outlet to their original condition. Eliminates bowl vibration and improves overall separation performance. 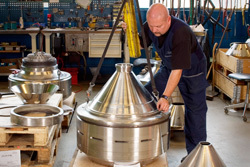 Each centrifuge is hydraulically tested under full capacity conditions prior to return shipping. Regardless of your application, Alfa Laval recommends at least some level of service or maintenance every 8,000 operating hours, or once every 12-months – for each high-speed separator in operation. Contact us today to schedule your service - 866-253-2528. Please fill out as much information as possible so we can get your request to the right person.